If email marketing is something you’ve thought about but are not sure what to write, this guest post from Julie Joseph, The Virtual Marketeer may give you some ideas. Email can be at the centre of your relationship marketing strategy and is a valuable communication tool that can be used in a myriad of ways. Whilst promotion is one option, using this channel for other communications is just as important and usually more effective in the long term. The key is delivering relevant communications to the right recipients that build relationships. Before you start sending emails, plan your campaigns thinking about their value for your audience whilst also considering how they can help you achieve your own business goals. Demonstrate your knowledge to your audience. Whether they are prospects or clients, demonstrate your awareness of and share insights into the industry you operate in or regarding products / services you offer. This can help them use your company in a better way or may take pressure off members of your team in answering questions. If you are stuck for ideas on what to write about talk to members of staff and see what they are being asked about. Is there a frequently occurring problem you can address in an email? Are there are any common product queries the sales team would like to get more information out about? Are there any interesting case studies you can write about? What industry news or trends can you comment on or add value by discussing? 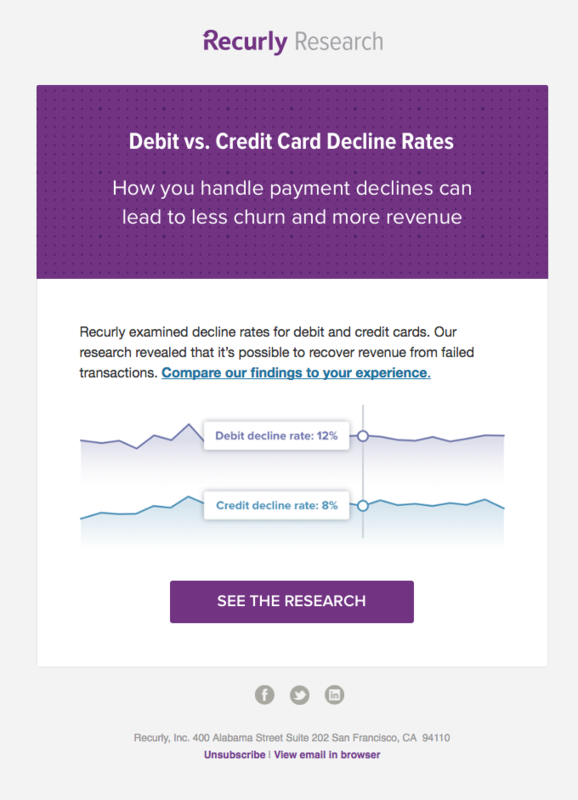 This email from Recurly looks great, showcases their research but makes it personal and takes you to an interactive page! A great follow up email following a purchase, this one from Framebridge helps recipients make the most of their art and is beautifully laid out. What has yoghurt got in common with fashion? Both are enjoyed by women. With Mullerlight Mondays, Muller send out emails every week with news and offers of interest to their audience. They do promote new flavours but content is not directly related to yoghurts all of the time. Innocent are another example of a brand who like to entertain throughout their emails (and marketing in general), often sharing random facts and interesting news. If your audience enjoys what they read they will keep engaging with your emails. Starbucks are great at making things topical and deliciously visual with their emails. Emails sent at the right time for the recipient will be among the most engaging! To do this the best way is to automate or trigger the communications. One of the most important and engaging emails is a welcome email, sent as soon as your recipients sign up. This should welcome subscribers to your programme and let them know what to expect from you in terms of frequency and content. 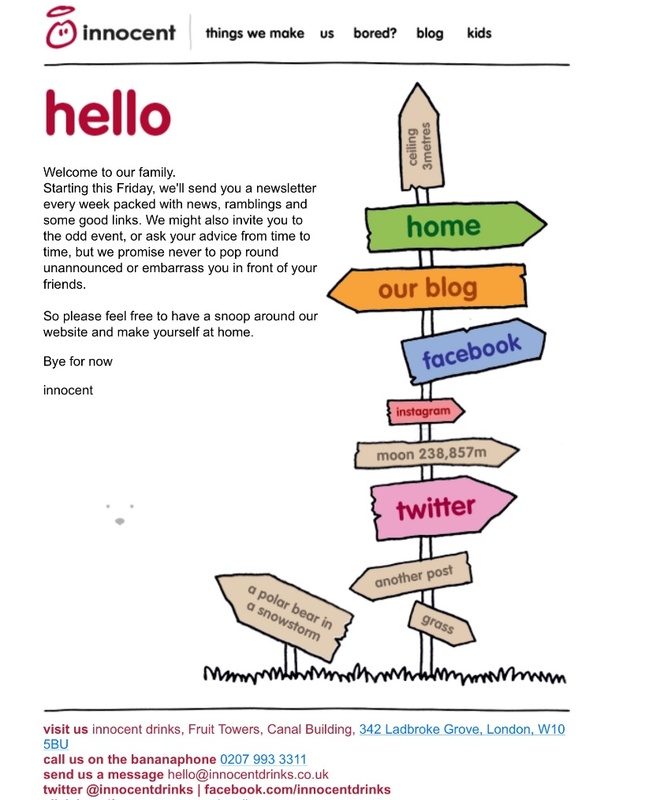 This welcome email from Innocent is great – to the point, nicely branded with links to social platforms and creatively gorgeous! 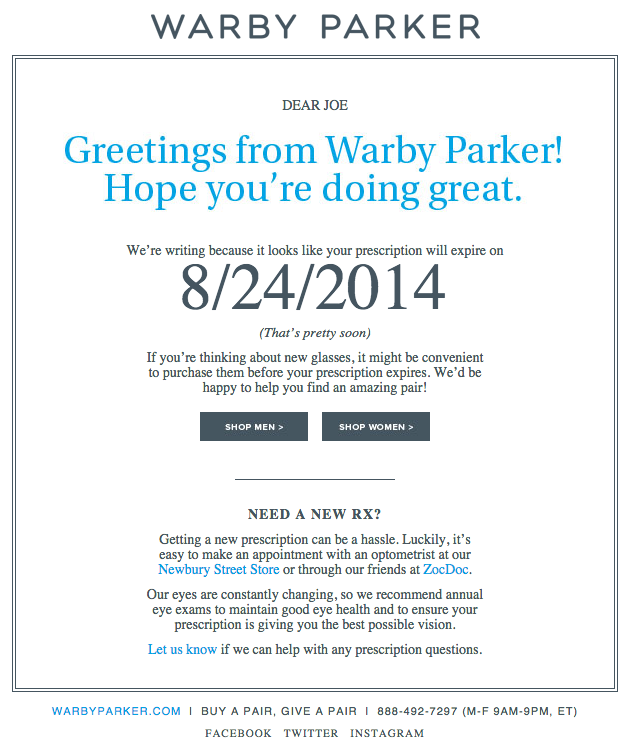 Timely emails can be very effective like this one from Warby Parker. The subject line was: “Uh-oh, your prescription is expiring.” Great personalised, timely messaging! If you deliver products, then send a follow up email. A customer service email which hopes they enjoy the product, gives them sources to go to for assistance and offers them the chance to write a review will be appreciated. Try to minimise cross or upselling and if you do, then make sure you select only relevant products. Other emails to trigger include Birthday offers, Re-engagement emails as well as basket and browse abandon emails. I once met a printer who had a great client who got loads of fancy, complex printing done. One day they met at a networking event and his client had new business cards, Curious he asked why the client hadn’t used him. “I didn’t know you did cards” came the reply. Email is a great way to let people know what else you offer or give an update related to something they have already purchased which helps retain clients. If you have just had a 360 tour for example, this is a great opportunity to let your database know and have a look so they can get more familiar with the place or relive fond memories to encourage a repeat visit! It’s also a great way to let customers know about a recent refurb making the experience very personal for them. For service companies, consider telling recipients about new services you offer but be sure not to try and promote something they get already. Or give useful insights in how to get the most out of certain products to customers of that product and then use the opportunity to cross sell additional products that would be suitable. But do your research and promote wisely. This simple but effective email from PayPal explains about sending money instantly in a great way whilst offering a usage scenario as well. 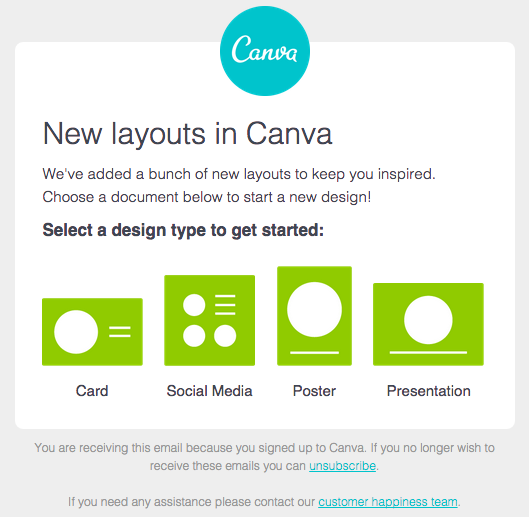 Canva also do this well, with a simple and effective email about new layouts. These are great if you have an excess stock of a particular product or just want to generate additional interest in a certain area. There are some people who will only buy when products are on sale but that’s not necessarily a bad thing – they are still regular clients. 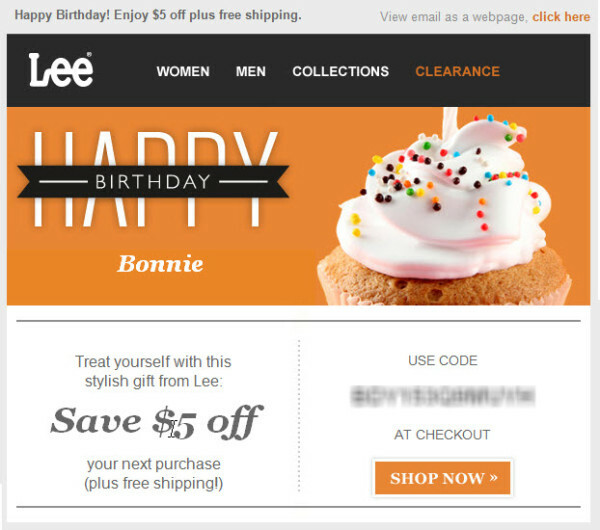 Lee offer a Birthday discount and free shipping for example. Do think carefully though and consider database segmentation as there is nothing worse than receiving an offer for the product you purchased yesterday. Pizza Express, along with other restaurants, offers a bottle of Prosecco for your Birthday which always goes down a treat – making it enticing and engaging! Make the use of fantastic imagery in your emails to really showcase any offers you make. Of course key events in the year always include a myriad of offers from retailers, but I love this email from the Book People which gives not 1 but 3 special offers! Events are a great way to drum up some extra interest. You could do an offline event in store – such as an exclusive evening for email recipients or an online event such as a webinar or special code for purchase. 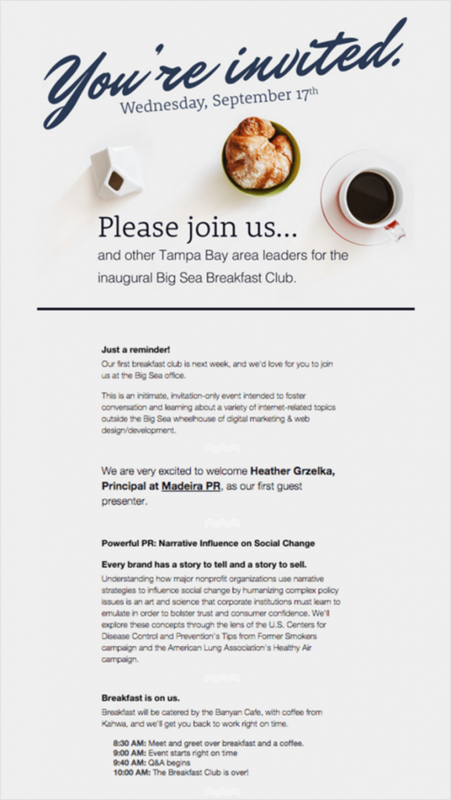 This email from Media Evolution focuses on a Livestream of their conference. Whatever you do, remember email is a great channel in which you own the data and can get directly on the radar of your recipients. But selling is the goal not the route. « Announcing the Charity Ball Auction List!